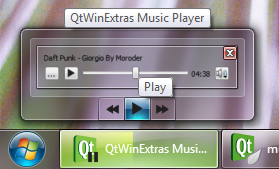 The Music Player example demonstrates how to use the various features provided by the QtWinExtras module. Note: The example uses QMediaPlayer from the QtMultimedia module to play the music, but this article focuses on the parts where QtWinExtras features are used. The example uses Windows DWM (Desktop Window Manager) features to visually integrate the window content to the window frame and to make the main window and the volume popup translucent and blurred. The example applies a different look based on whether composition is enabled or not. When composition is enabled, the main window is made translucent and the window frame is extended to the client area to make the window content integrate seamlessly to the window frame as shown above. When composition is disabled, the colorization color is used as a background color. The following screenshot illustrates how the Music Player example looks when composition is disabled. The respective code is a combination of extending or resetting the system frame, adjusting the necessary QWidget attributes, and setting an appropriate style sheet to achieve the desired look. The volume popup does not have a window frame so it is enough to make the popup blurred when composition is enabled. Additionally, a style sheet is applied to get a border that follows the colorization color. Just like for the main window, when composition is disabled, the colorization color is used as a background color. The example application respects the user's composition settings, reacts to dynamic composition changes, and looks solid regardless of whether composition is enabled or not. It accomplishes this by catching QWinEvent::CompositionChange and QWinEvent::ColorizationChange events and adjusting its looks accordingly. The example creates a custom jump list to provide the user with fast access to recently played music files. To enable the application jump list to show the desired recent files, the corresponding file types are registered using the following helper function. The example uses Windows Taskbar for two things; it sets an overlay icon that represents the current music playback state, and it indicates the playback progress in the taskbar button. The following snippet shows how the taskbar button is prepared. The playback progress is wired directly to the taskbar progress indicator by using signals and slots. The overlay icon and the progress indicator are updated whenever the state of the music playback changes. The Windows Thumbnail Toolbar is used for providing basic music playback controls. These controls can be used to control the application without having to activate the application. The buttons in the thumbnail toolbar are updated accordingly whenever the state of the music playback changes.